Last Saturday, I went in for my final day at my now legendary once a month Saturday job. The previous month, the owners of the hagwon had prepared cheese and crackers and wine for Eric and me thinking January was my last month. This month there were no special events to mark the occasion. Then I had to hotfoot it to Hongdae to hang out with Habiba and a bunch of friends for her leaving party. The drinking part of the night was at a couple of clubs that were far too noisy for my taste and I was too late for dinner. Noraebang was fun, though, and Habiba, Zach and I kind of dominated the microphones. Somehow, the karaoke machine go switched on to a harsh judging mode and, whereas these things usually give scores as integers in the 80 to 100% range, it kept handing out scores like 32.47. On Wednesday and Thursday, I ran what may be the last two sessions ever played of my roleplaying game, Tales of Tolvenia, which uses the system I created: the 2d6 RPG. The story moved a long a fair bit, and I end up making some stuff up on the fly, such as an ancient dwarf who called himself the Ancient and helped the party obtain a couple of artefacts that I planned for them to use to defeat the threat to the world. Without time constraints, I would have had made getting hold of each artefact an adventure in itself. In the end, we didn’t finish the campaign – the world is still threatened by ‘demons’ from the sea. We talked about continuing the game on the blog I set up to document the campain and system. On Friday, it was my last day at my main job – also many of the kindergarteners’ last day. 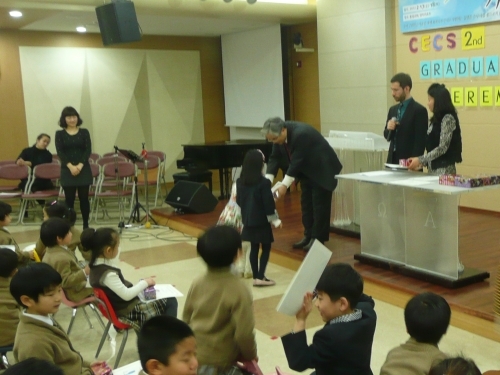 It wasn’t a regular school day, but instead we had a graduation ceremony – of which I was the presenter. I had written a script, but when it finally came to starting at around eleven o’clock, I pretty much winged it. I’m sure I came across as my normal exuberant, extroverted self. The awkwardest part was when I had to say a little something about each student as they received their diplomas from the church’s pastor. There followed a variety of combinations of comments on each kid’s good looks and intelligence. I saw my assistant teacher, Jenny, wipe away a tear at one point, but it wasn’t too weepy; everyone enjoyed the event – even me. Once it was over, we milled for maybe an hour so we could say goodbye to individual children and parents and have our pictures taken. One of my favourite students is Jun – he’s a big boy with a crew cut, very smart, very talkative, a bit boisterous. I joked that I would take him with me to Europe and he clamped his arms around my waist and was like, Teacher, go to Europe! A very sweet boy in my class, Luigi – also very smart and talkative, but much slighter in build and handsome in a cute way – gave me a red rose. I gave my homeroom class some chocolate and some sweet sesame seed mix (which latter was made by Habiba) and also a little card each that I made the previous day. After that, all the staff went to a buffet place called Vikings for lunch. It’s supposedly a seafood restaurant, but I didn’t have any, favouring instead, pizza, taco (Jenny at one point asked if taco was ‘our country’s food’, ie, Korean) and other tasty stuff. After lunch, my colleague Gemma went with me to a bank to help me transfer my savings to my British bank account. I had thought that not being official – no E2 visa, no pay statements etc – it would be impossible for me to do in my own name. Not so, apparently. I’d also brought to work my large packpack filled with various possessions. I left work early amid lots of awkward and maybe not fully sincere goodbyes … OK – it wasn’t that bad – the people who work there are very sweet, and it’s been one of my best working experiences in Korea. It’s just that, me being me, I don’t make friends very readily, especially at work. I took my massive backpack to the post and put all the stuff – and even the coat I was wearing – in a box and sent it to my sister. Then on Saturday, I had my own leaving party. I had lots of stuff to do that day, first of which was buying tickets for the film-going part of the evening’s events. I was somewhat annoyed to learn that, contrary to what it said on their website, CGV was not showing The Artist at 4:40 at our local cinema. Instead – after some sweating about what to do: there was nothing else showing at a convenient time at Cheongdam Cinecity – I was able to get information from the staff about films screening at the nearby Apgujeong CGV and decided on The Descendants. Unfortunately, I had to go to the other place to buy the tickets. I did this, but it took a bit out of the time available to me to perform my next task: to go to the hospital I’d previously attended with my colitis to get a prescription and letter about my illness and medication, because – as Eric helpfully pointed out and I confirmed by researching on-line – some countries may not allow you to bring in large amounts of medicine without documentation. I have six months’ worth of pills and suppositories. It wasn’t too late when I got there and was seen fairly rapidly. Unfortunately, I was told I’d have to come back later to pick up the letter. Next, it was my friend Ji-hyeon’s wedding. Korean weddings are generally pretty swift affairs: 20 minutes in a wedding hall followed by a big buffet meal. 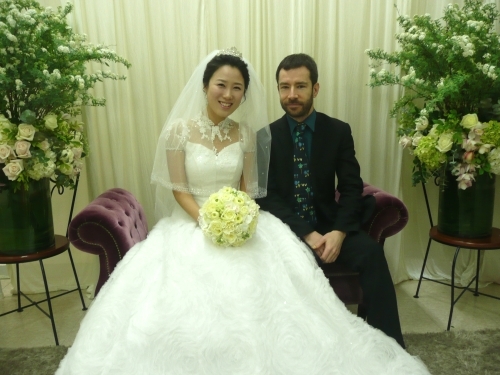 Ji-hyeon’s husband is a trainee Anglican vicar, however, and their wedding was at the Anglican Cathedral of Seoul and was what many Westerners would think of as a ‘real’ wedding, complete with a mass. Ji-hyeon seemed very happy when I went to ‘view’ her before the ceremony and I also briefly talked to her fiancé and he seemed very nice. In addition, I bumped into Ally or Yu-jeong, who originally introduced me to Ji-hyeon (or Lucy … or Lucia) nearly three years ago for the purposes of language exchange. Ally is also getting married this year; we had lunch together at the buffet down in the depths beneath the cathedral. Then I went back to the hospital to get my letter. Then I rushed home to meet Matthew, who was due to buy some of our stuff. 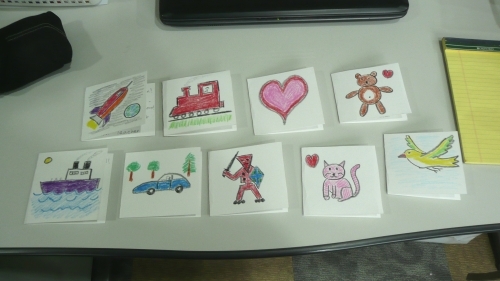 Then Habiba and I went to Apgujeong to meet Zach, and later Matt, to play Axe Cop Munchkin. Fun was had – especially by Habiba, who won. With a card as great as ‘Dinosaur Head on a Stick with Bombs in It’, I think I should have won. Despite the changes to the plan, everyone (the four Munchkins, Josh and his date, Julie, Eric, Mary and Demond) made it to the right place at the right time and we watched The Descendants. Everyone (apart from Eric, who is only cineastically satisfied by guns, explosions, fights etc) enjoyed it. I was planning to go bowling afterwards, but when we got to the alley, there was a long list of people waiting for lanes. Instead, we went to a board game café called Monopoly. The men played Monopoly, appropriately enough; Mike and the ladies played Tumbling Monkeys and other animal-related games. Monopoly was fun – if strange. Doubly strange for me. It was an updated American version, so all the places were Times Square instead of Mayfair or Mall of America instead on The Angel, Islington. In addition, the game was played with dominations of $10,000 to $5,000,000, the utilities were internet and cellphone services and all the Chance and Community Chest cards were updated with similarly contemporary events. We all had fun playing it, though. At least until Eric put a fly in the lubricant by taking his turn very quickly after Peter declared his intent to put a house on Las Vegas Boulevard, landing on Las Vegas Boulevard and refusing to pay the full rent because the little plastic house wasn’t yet on the board. Eric was fiercely adamant in his refusal and wouldn’t even countenance comprimising, even when he was left in a minority of one. The scene was pretty awkward and unpleasant, I ended up asking him to leave – which he did, wishing me farewell and goodnight to everyone else. We had no stomach for further play after that, and the womenfolk had already stopped playing, so we counted up our net worths and declared that Matthew was the winner with $26,000,000 – up from starting assets of $15,000,000. We said more goodbyes, Peter and Matt came back to our place to grab even more stuff, said more goodbyes and finally we could return to packing. Specifically, pack a couple of boxes, which, the following day, we took to Ksan and Jun Hong’s house for them to store for us for a year. We packed our bags on that last Sunday, did some more cleaning, sent some of my important documents by Fedex (Habiba gave me a couple of coffee shop free drink cards to the Fedex guy who spoke English – there was nothing for his less linguistic colleage) and finally set off for the airport at about eight o’clock – catching an airport bus by the skin of our teeth. And so begins our adventure in Europe.